This article is about biological tissue. For the moth, see Triphosa dubitata. For other uses, see Tissue (disambiguation). Cross section of sclerenchyma fibers in plant ground tissue. The English word "tissue" is derived from the French "tissu", meaning something that is "woven", from the verb tisser, "to weave". 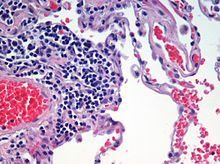 The study of human and animal tissues is known as histology or, in connection with disease, histopathology. For plants, the discipline is called plant anatomy. The classical tools for studying tissues are the paraffin block in which tissue is embedded and then sectioned, the histological stain, and the optical microscope. In the last couple of decades,[clarification needed] developments in electron microscopy, immunofluorescence, and the use of frozen tissue sections have enhanced the detail that can be observed in tissues. With these tools, the classical appearances of tissues can be examined in health and disease, enabling considerable refinement of medical diagnosis and prognosis. PAS diastase showing the fungus Histoplasma. Animal tissues are grouped into four basic types: connective, muscle, nervous, and epithelial. Collections of tissues joined in structural units to serve a common function compose organs. While all eumetazoan animals (i.e. except Porifera) can generally be considered to contain the four tissue types, the manifestation of these tissues can differ depending on the type of organism. For example, the origin of the cells comprising a particular tissue type may differ developmentally for different classifications of animals. The epithelium in all birds and animals is derived from the ectoderm and endoderm, with a small contribution from the mesoderm, forming the endothelium, a specialized type of epithelium that composes the vasculature. By contrast, a true epithelial tissue is present only in a single layer of cells held together via occluding junctions called tight junctions, to create a selectively permeable barrier. This tissue covers all organismal surfaces that come in contact with the external environment such as the skin, the airways, and the digestive tract. It serves functions of protection, secretion, and absorption, and is separated from other tissues below by a basal lamina. Connective tissues are fibrous tissues. They are made up of cells separated by non-living material, which is called an extracellular matrix. This matrix can be liquid or rigid. For example, blood contains plasma as its matrix and bone's matrix is rigid. Connective tissue gives shape to organs and holds them in place. Blood, bone, tendon, ligament, adipose, and areolar tissues are examples of connective tissues. One method of classifying connective tissues is to divide them into three types: fibrous connective tissue, skeletal connective tissue, and fluid connective tissue. Muscle cells form the active contractile tissue of the body known as muscle tissue or muscular tissue. Muscle tissue functions to produce force and cause motion, either locomotion or movement within internal organs. Muscle tissue is separated into three distinct categories: visceral or smooth muscle, found in the inner linings of organs; skeletal muscle, typically attached to bones, which generate gross movement; and cardiac muscle, found in the heart, where it contracts to pump blood throughout an organism. Cells comprising the central nervous system and peripheral nervous system are classified as nervous (or neural) tissue. In the central nervous system, neural tissues form the brain and spinal cord. In the peripheral nervous system, neural tissues form the cranial nerves and spinal nerves, inclusive of the motor neurons. The epithelial tissues are formed by cells that cover the organ surfaces, such as the surface of skin, the airways, the reproductive tract, and the inner lining of the digestive tract. The cells comprising an epithelial layer are linked via semi-permeable, tight junctions; hence, this tissue provides a barrier between the external environment and the organ it covers. In addition to this protective function, epithelial tissue may also be specialized to function in secretion, excretion and absorption. Epithelial tissue helps to protect organs from microorganisms, injury, and fluid loss. The cells of the body's surface form the outer layer of skin. Inside the body, epithelial cells form the lining of the mouth and alimentary canal and protect these organs. Epithelial tissues help in absorption of water and nutrients. Epithelial tissues help in the elimination of waste. Epithelial tissues secrete enzymes and/or hormones in the form of glands. Some epithelial tissue perform secretory functions. They secrete a variety of substances such as sweat, saliva (mucus), enzymes, etc. In plant anatomy, tissues are categorized broadly into three tissue systems: the epidermis, the ground tissue, and the vascular tissue. Vascular tissue - The primary components of vascular tissue are the xylem and phloem. These transport fluids and nutrients internally. Apical Meristem - It is present at the growing tips of stems and roots and increases the length of the stem and root. They form growing parts at the apices of roots and stems and are responsible for the increase in length, also called primary growth. This meristem is responsible for the linear growth of an organ. Lateral Meristem - This meristem consists of cells which mainly divide in one plane and cause the organ to increase in diameter and growth. Lateral meristem usually occurs beneath the bark of the tree in the form of Cork Cambium and in vascular bundles of dicots in the form of vascular cambium. The activity of this cambium results in the formation of secondary growth. Intercalary Meristem - This meristem is located in between permanent tissues. It is usually present at the base of the node, internode and on leaf base. They are responsible for growth in length of the plant and increasing the size of the internode. They result in branch formation and growth. Meristematic tissue cells have a large nucleus with small or no vacuoles, and no intercellular spaces. special or secretory tissues (glandular). Parenchyma (para - 'beside'; enchyma - 'tissue') is the bulk of a substance. In plants, it consists of relatively unspecialized living cells with thin cell walls that are usually loosely packed so that intercellular spaces are found between cells of this tissue. These are generally isodiametric, in shape. This tissue provides support to plants and also stores food. In some situations, parenchyma contains chlorophyll and performs photosynthesis, in which case it is called a chlorenchyma. In aquatic plants, large air cavities are present in parenchyma to give support to them to float on water. Such a parenchyma type is called aerenchyma. Some of the parenchyma cells have metabolic waste and is known as idioblast. Spindle shape fiber also contained into this cell to support them and known as prosenchyma, succulent parenchyma also noted. Collenchyma is Greek word where "Collen" means gum and "chyma" means infusion. It is a living tissue of primary body like Parenchyma. Cells are thin-walled but possess thickening of cellulose, water and pectin substances (pectocellulose) at the corners where a number of cells join together. This tissue gives tensile strength to the plant and the cells are compactly arranged and have very little inter-cellular spaces. It occurs chiefly in hypodermis of stems and leaves. It is absent in monocots and in roots. Sometimes it contains chlorophyll which can help them photosynthesize. Collenchymatous tissue acts as a supporting tissue in stems of young plants. It provides mechanical support, elasticity, and tensile strength to the plant body. It helps in manufacturing sugar and storing it as starch. It is present in the margin of leaves and resists tearing effect of the wind. Schlerenchyma is Greek word where "Schlerena" means hard and "chyma" means infusion. This tissue consists of thick-walled, dead cells and protoplasm is negligible. These cells have hard and extremely thick secondary walls due to uniform distribution and high secretion of lignin. They do not have intermolecular space between them. Lignin deposition is so thick that the cell walls become strong, rigid and impermeable to water which is also known as a stone cell or sclereids. These tissues are mainly of two types: sclerenchyma fiber and sclereids. Schlerenchyma cells have a narrow lumen and are long, narrow and unicellular. The entire surface of the plant consists of a single layer of cells called epidermis or surface tissue. The entire surface of the plant has this outer layer of the epidermis. Hence it is also called surface tissue. Most of the epidermal cells are relatively flat. The outer and lateral walls of the cell are often thicker than the inner walls. The cells form a continuous sheet without intercellular spaces. It protects all parts of the plant. Xylem and phloem together form vascular bundles. Cross section of 2-year-old Tilia Americana, highlighting xylem ray shape and orientation. Xylem serves as a chief conducting tissue of vascular plants. It is responsible for the conduction of water and mineral ions/salt. Xylem tissue is organized in a tube-like fashion along the main axes of stems and roots. It consists of a combination of parenchyma cells, fibers, vessels, tracheids, and ray cells. Longer tubes made up of individual cells are vessels tracheids, while vessel members are open at each end. Internally, there may be bars of wall material extending across the open space. These cells are joined end to end to form long tubes. Vessel members and tracheids are dead at maturity. Tracheids have thick secondary cell walls and are tapered at the ends. They do not have end openings such as the vessels. The tracheids end overlap with each other, with pairs of pits present. The pit pairs allow water to pass from cell to cell. Though most conduction in xylem tissue is vertical, lateral conduction along the diameter of a stem is facilitated via rays. Rays are horizontal rows of long-living parenchyma cells that arise out of the vascular cambium. In trees and other woody plants, rays radiate out from the center of stems and roots and appear like spokes on a wheel in cross section. Rays, unlike vessel members and tracheids, are alive at functional maturity. Phloem is an equally important plant tissue as it also is part of the 'plumbing system' of a plant. Primarily, phloem carries dissolved food substances throughout the plant. This conduction system is composed of sieve-tube member and companion cells, that are without secondary walls. The parent cells of the vascular cambium produce both xylem and phloem. This usually also includes fibers, parenchyma and ray cells. Sieve tubes are formed from sieve-tube members laid end to end. The end walls, unlike vessel members in xylem, do not have openings. The end walls, however, are full of small pores where cytoplasm extends from cell to cell. These porous connections are called sieve plates. In spite of the fact that their cytoplasm is actively involved in the conduction of food materials, sieve-tube members do not have nuclei at maturity. It is the companion cells that are nestled between sieve-tube members that function in some manner bringing about the conduction of food. Sieve-tube members that are alive contain a polymer called callose, a carbohydrate polymer, forming the callus pad/callus, the colourless substance that covers the sieve plate. Callose stays in solution as long as the cell contents are under pressure. Phloem transports food and materials in plants upwards and downwards as required. Mineralized tissues are biological tissues that incorporate minerals into soft matrices. Such tissues may be found in both plants and animals, as well as algae. Typically these tissues form a protective shield against predation or provide structural support. The term was introduced in anatomy by Marie François Xavier Bichat in 1801. He argued that the body functions would be better understood taking as unity of study the tissues, and not the organs. Bichat distinguished 21 types of elementary tissues for the human body, a number later reduced by other authors. Cells – The basic structural and functional unit of all organisms; the smallest unit of life. ^ Bock, Ortwin (2015-01-02). "A history of the development of histology up to the end of the nineteenth century". Research. 2015;2:1283. doi:10.13070/rs.en.2.1283.